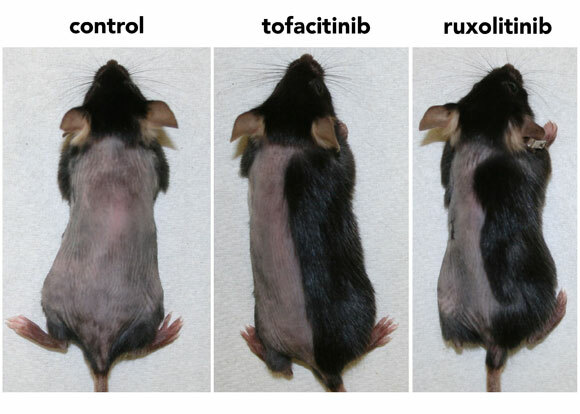 Within 3 weeks, mice that received topical ruxolitinib or tofacitinib had regrown nearly all their hair (right photo; drug was applied only to the right side of the mouse). Little to no hair growth occurred in control mice during the same timeframe (left photo). Image credit: From S. Harel et al., Sci. Adv. 1, e1500973 (2015). New research from Columbia University reveals that inhibiting a family of enzymes inside hair follicles restores hair growth. The research is published in the online edition of Science Advances. In experiments with mouse and human hair follicles, Angela M. Christiano, PhD, and colleagues found that drugs that inhibit the Janus kinase (JAK) family of enzymes promote rapid and robust hair growth when applied to the skin. The study raises the possibility that JAK inhibitors could be used to restore hair growth in forms of hair loss induced by male pattern baldness, and other types of hair loss that occur when hair follicles are trapped in a resting state. Two JAK inhibitors have been approved by the U.S. Food and Drug Administration. One is approved for treatment of blood diseases (ruxolitinib) and the other for rheumatoid arthritis (tofacitinib). Both are being tested in clinical trials for the treatment of plaque psoriasis and alopecia areata, an autoimmune disease that causes hair loss. Christiano and her colleagues serendipitously discovered the effect of JAK inhibitors have on hair follicles when they were studying alopecia areata, a form of hair loss that’s caused by an autoimmune attack on the hair follicles. Christiano and colleagues reported last year that JAK inhibitors shut off the signal that provokes the autoimmune attack, and that oral forms of the drug restore hair growth in some people with the disorder. In the course those experiments, Dr. Christiano noticed that mice grew more hair when the drug was applied to the skin than when the drug was given systemically. This suggested JAK inhibitors might be doing something to the hair follicles in addition to stopping the immune attack. When the researchers looked more closely at normal mouse hair follicles, they found that JAK inhibitors rapidly awakened resting follicles out of dormancy. Hair follicles do not produce hair steadily, but cycle between dormant and active phases. JAK inhibitors trigger the follicles’ normal reawakening process, the researchers found. Mice treated for five days with one of two JAK inhibitors sprouted new hair within 10 days, greatly accelerating the onset of hair growth. No hair grew on control mice within the same amount of time. “There aren’t many compounds that can push hair follicles into their growth cycle so quickly,” said Dr. Christiano. “Some topical agents induce tufts of hair here and there after a few weeks, but very few compounds have this potent an effect so quickly.” The drugs also produce longer hair from human hair follicles grown in culture and on skin grafted onto mice. It’s likely that the drugs act on the same pathways in human follicles as they do in mice, suggesting they could induce new hair growth and extend the growth of existing hairs in humans. However, whether JAK inhibitors can reawaken hair follicles that have been frozen in a resting state because of androgenetic alopecia (which causes male and female pattern baldness) or other forms of hair loss is still unknown. So far, all the experiments have been conducted in normal mice and human follicles. Experiments to address hair follicles affected by hair loss disorders are under way. 2 Comments on "Scientists Show That Blocking Enzymes in Hair Follicles Promotes Hair Growth"
Does this mean that JAK only works for those with hair loss disorder, human or not? The images of the hair loss on the rats are certainly dramatic, but what caused that degree of hair loss in the control group to start with?